Join us once again in Buncrana for the 6th West Inishowen History and Heritage Summer School. This year’s event is organised by the West Inishowen History & Heritage Society in association with the Irish Labour History Society. The theme for 2016 explores the legacy of John Doherty, a young mill worker from Buncrana who rose through the ranks of the English Labour movement to become a leading campaigner for workers’ rights in the early nineteenth century. Throughout the week we will explore the life of John Doherty, the lives of workers in the north west of Ireland, and the fortunes of the many Irish people who went to find work in Britain. 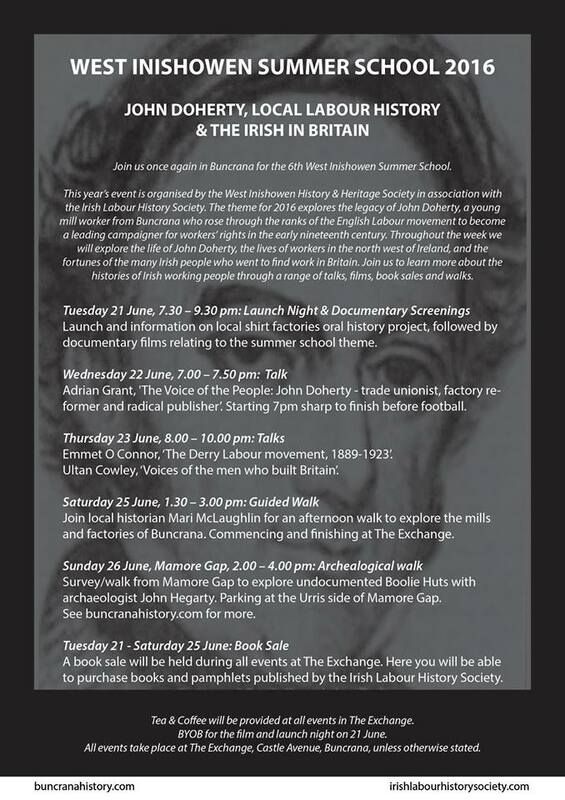 Join us to learn more about the histories of Irish working people through a range of talks, films, book sales and walks. A book sale will be held during all events at The Exchange. Here you will be able to purchase books and pamphlets published by the Irish Labour History Society. Tea & Coffee will be provided at all events in The Exchange. BYOB for the film and launch night on 21 June. All events take place at The Exchange, Castle Avenue, Buncrana, unless otherwise stated. Tuesday 21 June, 7.30 – 9.30 pm (The Exchange, Buncrana): Launch Night & Documentary Screenings. Join us in The Exchange, Castle Avenue, Buncrana as WIH&HS Chairperson Dr Michael L Gorry officially opens the 6th Annual WIH&HS Summer School, followed by information on Dr Adrian Grant’s local shirt factories oral history project. Emmet O Connor, ‘The Derry Labour Movement, 1889-1923’.